Note: This post appeared in some RSS feeds prematurely because I accidentally hit the wrong button while working on it. This is the completed version, sorry for the confusion. Adams Golf is a small golf manufacturer located in Texas, they make the full range of clubs and associated accessories such as bags and hats. I haven't ever played on an Adams club, so I went online looking for reviews. Most agreed with the statement that the irons were about average and the hybrids were really nice clubs. I wouldn't mind adding a hybrid to my set, so if a very generous reader out there wants to buy me a Adams hybrid I will be sure to put it through a few rounds of "testing". I talked to some relatives who are more "in the know" with golf gear, and their opinion was that Adams Golf made some decent stuff. -Room for margin expansion, current net margin 5.53%, net margin in 2006 was 11.84% and 2007 9.94%. A few things stand out, the first is that for a manufacturing company Adams Golf has a very small amount of property plant and equipment. The reason for this is that the manufacturing facilities are leased and found under contractual obligations. The facility operating lease is up in 2013, so there is a potential that costs could slightly tick up for the facility. The other aspect is that inventory and receivables make up the bulk (80%) of NCAV, this is expected for a manufacturing concern. Both inventory and receivables as a percentage are at reasonable levels compared to past history. The balance sheet is good, I think all of the values on the worksheet are reasonable in a liquidation scenario. Golf clubs tend to sell relatively quickly, and even models a year old sell pretty easily. The difference between a 2010 and a 2011 club isn't all that great no matter what the marketing people would want you to believe. For any business selling below NCAV we have to assume there's a problem, if there isn't a problem the stock probably isn't selling cheap. The case with Adams Golf is a little interesting, I think there are a few reasons the stock is selling cheaply. The first and most benign is that the company has a history of lumpy profitability. In the last ten years they've been profitable 60% of the time. The company has a high degree of operating leverage so when they hit a high volume the profits and cash roll in. On the other hand a slight downtick in volumes can result in a loss. The lumpy profits means uncertainty on Wall Street, and Wall Street hates uncertainty giving Adams a lower multiple. The second reason is that Adams was involved in a class action lawsuit related to their IPO in 1999; they ended up losing with a verdict of $16.5m issued against them. Insurance paid out $11.5 million, and Adams paid out $5m which was accrued in 2010. In addition there is still a patent infringement lawsuit outstanding which is currently in discovery. The outcome of the lawsuit is uncertain, and if it goes against them a negative verdict could require either a payment, a club sales halt , or a redesign of certain models, all costly solutions. The third reason is that management isn't exactly viewed as shareholder friendly. For the past ten years shares outstanding has been steadily increasing due to executive compensation. Compensation that isn't always deserved considering the company has only been profitable 60% of the time, and had free cash flow 50% of the time. The following picture gives a nice overview of the past ten years. 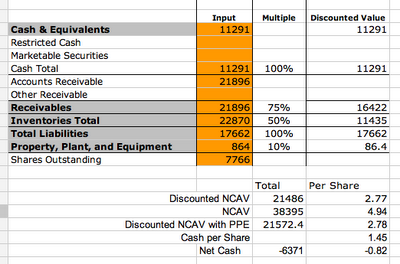 I show the cash flow (operating, capex, and free cash flow), in addition to the book value. I also show the ROIC with the positive ROIC in bold. What the spreadsheet reinforces is that when times are good and volume comes in ROIC can be high, very high (60% in 2004). ROIC for the past twelve months isn't all that high, but it is positive. Considering that Adams is coming out of a downturn there is a lot of room for improvement. (v) as instructed by the Gregorys on all other matters presented to a vote of the stockholders at such meeting. After the filing the price moved up a bit, but there is still a lot of room to move, especially if the company starts to move in a more shareholder friendly direction. I think Adams Golf has a lot of potential, especially for margin expansion and some possibly shareholder friendly moves. I think the current assets also provide a nice bit of downside protection. I haven't invested in Adams Golf yet but I'm watching this situation closely.